The agricultural development project Resilience and Economic Growth in Arid Lands – Accelerated Growth (REGAL-AG) has promoted improved livestock management that resulted in a decrease in net emissions of 10%. Since emissions from livestock account for the majority of Kenya’s agricultural emissions (95%), reduction of emissions in the livestock sector has high potential impact. REGAL-AG’s interventions have sought to improve links between livestock producers and buyers, to boost producer access to critical inputs, and to increase availability of timely market information, which resulted in a decrease in slaughter age for all livestock types. REGAL- AG anticipated that these dynamics, coupled with the program outreach activities, could result in a 10% decrease in herd size, which drives the greater share of emission reductions. Increases in productivity (50–67%) and decreases in absolute emissions (-10%) that resulted from REGAL-AG’s interventions decreased the emission intensity 33-40% (emissions per unit production) for all livestock types. Nash J, Grewer U, Bockel L, Galford G, Pirolli G, White J. 2016. 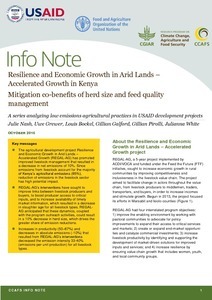 Resilience and Economic Growth in Arid Lands – Accelerated Growth in Kenya: Mitigation co-benefits of herd size and feed quality management. CCAFS Info Note. Copenhagen, Denmark: International Center for Tropical Agriculture (CIAT) and the Food and Agriculture Organization of the United Nations (FAO).